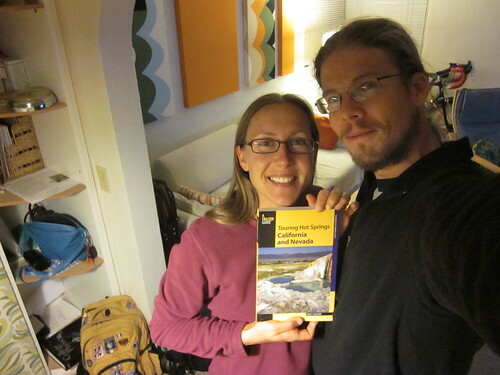 Our copy of the hot spring book came in the mail today! Out of the blue one day, I was contacted by the editor's assistant at Falcon Guides (her name was Jessica). I was contacted through my Flickr account, so I knew that it was probably a request to use one of my pictures. 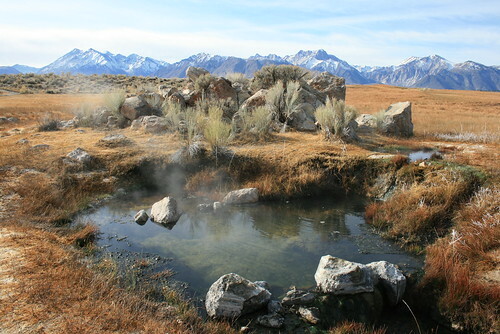 When I opened up the e-mail I was soooooooo surprised to see that the editor was looking for hot spring pictures to update the Touring Hot Springs California and Nevada book by Matt Bischoff! That is our hot spring bible! Literally, we've taken that book everywhere and it was the first hot spring book we ever purchased when we first got into hot springing! This is the picture that made the back cover of the book, the source at Wild Willy's. I was extremely happy, I couldn't believe it. 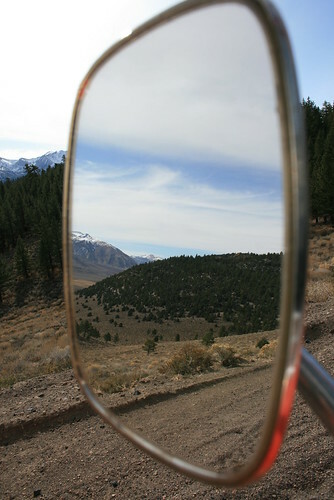 I guess what started as a curiosity at one of the VW Bus camp outs (when Melissa told us about Buckeye Hot Spring near Bridgeport) turned into a total obsession! 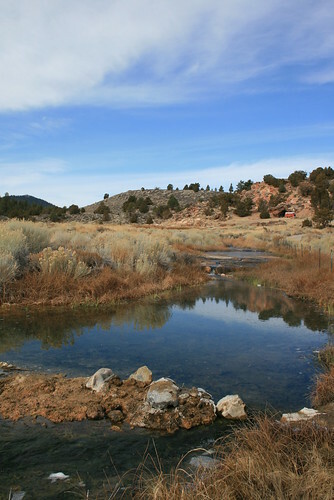 Since Melissa first pointed us to Buckeye and let us borrow her book (the same book our pictures were being requested to use in), we've been hunting all of the nearby hot springs down and taking pictures. On my Flickr account, I mainly just store pictures there as a back-up, so I had all of the hot spring pictures we ever took up there. The bus is now famous because this picture was published in the book too. See the bus!? 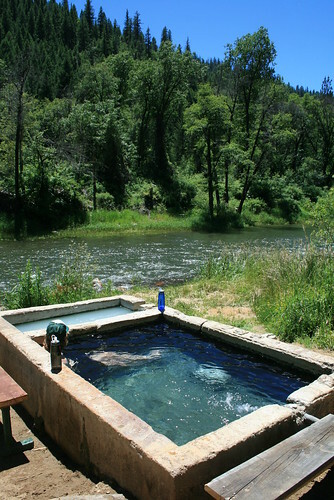 Jessica originally asked to use a picture we took at Woody's Hot Spring near Quincy California. However, I let her know of my entire album of hot spring pictures that we've collected and posted on Flickr. She was really happy that I pointed her to all those pictures, because I guess she was having some trouble finding some good ones for a lot of the other springs in CA and NV! Well, after I signed an agreement giving Falcon Guides permission to use the pictures in the book, I didn't hear anything for a few months. Jessica said that when the book was ready to be published (the 3rd edition is what she was working on), she would send a copy to us. Well, today it arrived in the mail!!!! Now this has nothing to do with hot springs, but I guess Jessica liked it. The bus again! When I opened up the book today, I expected to find only our Woody's picture in it. But oh my god was it way more than that! Flipping the book over to look at the back cover, I noticed a very familiar scene - it was one of the pictures we took at Wild Willy's! Then when I opened up the book to start looking inside (the new edition had really nice glossy pages and everything's in color), we realized that a bunch of our pictures were in there! Woooooooo! All in all, our pictures of Wild Willy's, Woody's, Eagleville, Hunt, Buckeye, Hot Tub, Crab Cooker, Shepherd's, Little Hot Creek, Mono, Hyder, and Spencer made the book. Plus our VW bus got in two of the shots too, hehehehe! The picture request that started it all, Woody's Hot Spring.